You enlarge things by dropping a "big" mushroom on top of them, kind of the same way you add wings to a Koopa, to make it a flying Koopa. I think a lot of the newer stuff is unlocks. Build all the stages, then start adding behaviours, etc. Moving platforms you can alter the direction they go by clicking on them. You can also alter some enemies by shaking them. That's how you switch between green and red turtles, for example. Whenever you get a new enemy or item, try shaking it! I just put a new level up, and I'm pretty proud of it. A little gimmicky, but just fun to do. I felt like I was building MouseTrap! Do options for power-up progression -- situations where regular Mario gets a mushroom from a particular block, but Super Mario gets a fire flower instead -- unlock later on? If not, that has a definite impact on how "traditional Mario"-styled levels are created. - If you don't get hit, they provide a more substantial reward (fire flower, raccoon tail, etc.) for that mastery that is tied to a new mechanic that puts a new twist on that more demanding section. Without power-up progression, you only get the first two of those three and the sense of accomplishment from earning that second-tier power-up through mastery is gone. I was thinking about that, too, Ozy. Definitely a disappointing oversight. Edit: Thinking about it more, it's not an oversight. It was a choice, and I understand why they did it. It was probably the right choice to make. But it certainly does change the shape and flow of levels. Trying to go fairly traditional with the level design at first. For those aren't following me yet, just had some fun as the Bullet Bills unlocked. Wish I'd dropped a few more blocks to get the castle pieces unlocked tonight, but it's 12:30am (yep, THAT late, LOVE IT!) so I'm off to bed (in theory). Last last code "O" should be the number "0". Giving it a try now. I'm having battery life issues. Alas I missed my game delivery on Friday and I'm impatiently waiting to collect it tomorrow so I can join in on the fun. I even doodled on a napkin, at work, a design I hope to try when I get the chance :). Yeah, I'm enjoying the gradual unlocks. I was quite annoyed by them last night when I sat down to work and had only the tools I'd already had. But it ended up forcing me to really work with those tools, and the levels I made ("Classic Underground" and "High & Low") were much more successful as a result. Yeah! The constraints do help with basic level design, I think. Agreed with the feeling that the gradual unlocks are good. Learning how these things work is going to (for me) be important when I have all the pieces. The 100 Mario expert challenge is kinda bad. 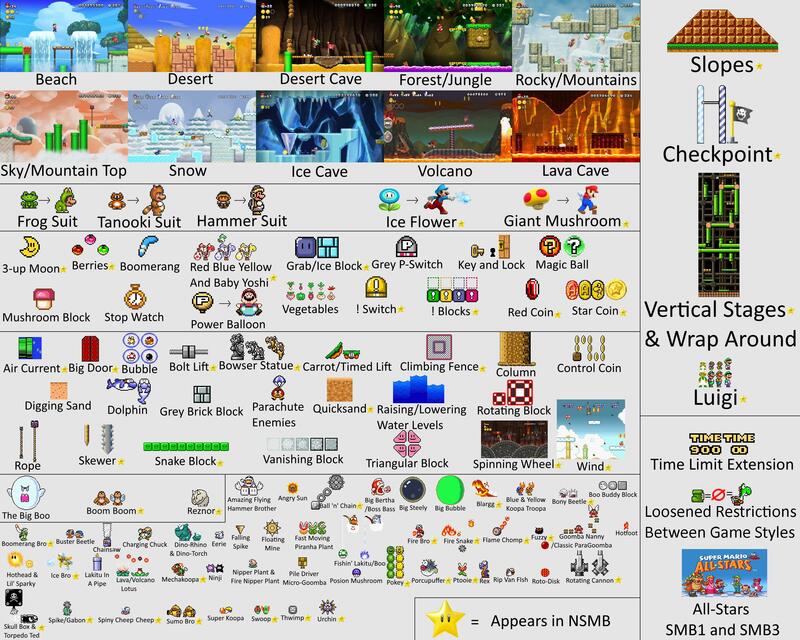 It mostly ends up being not just hard levels but bad and hard levels. I expect that to be the case for awhile. Levels that are bad but still difficult to clear are ridiculously easy to make. So apparently my Miiverse comments are using my real first name. If your levels get comments from Marshall, that's probably me. I'd thought I'd associated a handle with the Mii somehow, but I guess not. I never really expected to go online with the Wii U so I didn't pay much attention to those settings. I hope there is a way for good levels versus gimmicky levels to rise to the top. I tried it a few times and yeah, most of the time it's bad. Is the main reason to do it just to unlock all the little characters? That'll be a slog. Miiverse uses the name you have your Mii. Just rename it. That's when the option to skip comes in handy. I would appreciate any feedback on my level. Excited to see what everyone else is making to. Honorable mention to both of these being pressed simultaneously to initiate 'quick erase' mode if you only need to delete an element, but don't want to go into erase mode completely (kind of a quick switch option while held). I actually made a "kid's version" of a Castle level - pretty easy, but if anyone has young kids checking out the game and you're following me, have them give it a shot! Really it was just an excuse to use some of the Castle tileset for today, but it's a good primer of Castle stuff, I think. Edit: Will probably show up as "Ryan" on MiiVerse.